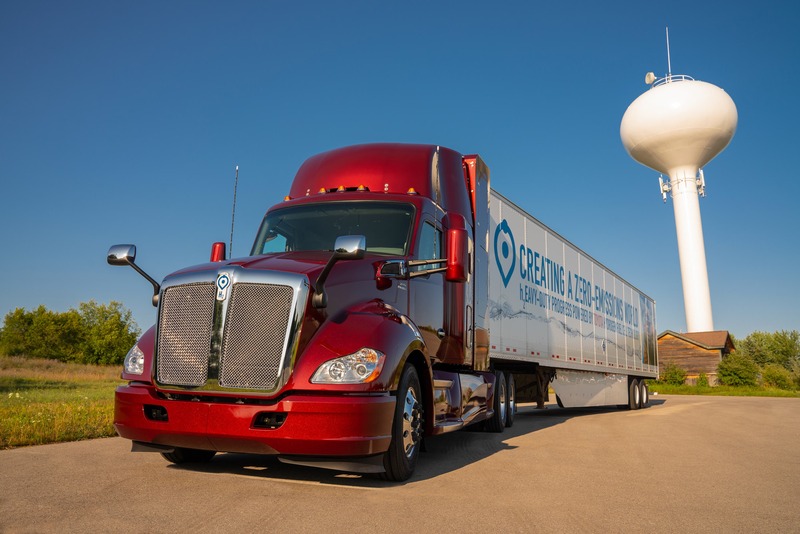 Toyota unveiled version 2.0 of its hydrogen fuel cell electric Class 8 truck at a Management Briefing Seminar at the Center for Automotive Research (CAR) today. The new truck builds on Toyota’s learnings from version 1.0 of the truck, which it had dubbed the Alpha Truck. The naming convention was carried through to the current version, which has been christened as the Beta truck. Of course, this follows the pre-production naming convention used for software releases. The Beta truck has received a range boost that allows it to travel more than 300 miles per fill up — an increase from the 200 mile range of the Alpha truck — and now comes with a sleeper cab that has been combined with the fuel cabinet that allows for more usable space without increasing the wheelbase on the vehicle. The increase in range was one of the many improvements Toyota rolled into the Beta truck based on lessons learned from the more than 10,000 miles it has put on the Alpha truck since April of 2017 in the ports of Long Beach and Los Angeles. On the performance side of things, Toyota’s Beta truck maintains the 670 horsepower and 1,325 pound-feet of torque that the Alpha truck produced from its twin Toyota Mirai fuel cell stacks and 12kWh battery. These specs enable its gross combined weight capacity of 80,000 lb. The Alpha truck was taken from concept to prototype in less than a year to see if Toyota’s hydrogen fuel cell technology could be a good fit for a Class 8 heavy duty truck. The improvements rolled into the Beta truck continue the rapid deployment strategy, with the truck slated to move into full operations in the fall at the ports of Long Beach and Los Angeles. The paired ports of Long Beach and Los Angeles are serviced by 16,000 heavy trucks today and have become a hotspot for poor air quality as a result. As a result, the area has become the focus of efforts by the South Coast Air Quality Management District (SCAQMD) to improve air quality, especially as the number of trucks servicing the ports is expected to double to more than 32,000 trucks per day in 2030. Looking out across the United States, there are more than 43,000 drayage trucks working in ports that could also benefit from the work being done by Toyota if the solution is determined to be commercially viable. That’s exactly the focus for Toyota as it looks to use the Beta truck to take its hydrogen-powered truck to the masses. To further sweeten the deal, Toyota is generating renewable hydrogen at its Toyota Logistics Services facility in the Port of Long Beach. As we shared last year, the plant will use agricultural waste to generate water, electricity, and hydrogen that will support Toyota Logistics Services’ (TLS) operations at the Port of Long Beach as well as its growing fleet of hydrogen trucks working in the ports.